Presented here is a straightforward method for the isolation and flow cytometric analysis of glioma-infiltrating peripheral blood mononuclear cells that yields time-dependent quantitative data on the number and activation status of immune cells entering the early brain tumor microenvironment. Baker, G. J., Castro, M. G., Lowenstein, P. R. Isolation and Flow Cytometric Analysis of Glioma-infiltrating Peripheral Blood Mononuclear Cells. J. Vis. Exp. (105), e53676, doi:10.3791/53676 (2015). Our laboratory has recently demonstrated that natural killer (NK) cells are capable of eradicating orthotopically implanted mouse GL26 and rat CNS-1 malignant gliomas soon after intracranial engraftment if the cancer cells are rendered deficient in their expression of the β-galactoside-binding lectin galectin-1 (gal-1). More recent work now shows that a population of Gr-1+/CD11b+ myeloid cells is critical to this effect. To better understand the mechanisms by which NK and myeloid cells cooperate to confer gal-1-deficient tumor rejection we have developed a comprehensive protocol for the isolation and analysis of glioma-infiltrating peripheral blood mononuclear cells (PBMC). The method is demonstrated here by comparing PBMC infiltration into the tumor microenvironment of gal-1-expressing GL26 gliomas with those rendered gal-1-deficient via shRNA knockdown. The protocol begins with a description of how to culture and prepare GL26 cells for inoculation into the syngeneic C57BL/6J mouse brain. It then explains the steps involved in the isolation and flow cytometric analysis of glioma-infiltrating PBMCs from the early brain tumor microenvironment. The method is adaptable to a number of in vivo experimental designs in which temporal data on immune infiltration into the brain is required. The method is sensitive and highly reproducible, as glioma-infiltrating PBMCs can be isolated from intracranial tumors as soon as 24 hr post-tumor engraftment with similar cell counts observed from time point matched tumors throughout independent experiments. A single experimentalist can perform the method from brain harvesting to flow cytometric analysis of glioma-infiltrating PBMCs in roughly 4-6 hr depending on the number of samples to be analyzed. Alternative glioma models and/or cell-specific detection antibodies may also be used at the experimentalists’ discretion to assess the infiltration of several other immune cell types of interest without the need for alterations to the overall procedure. Gliomas are a class of neuroepithelial brain cancers arising from transformed glia within the central nervous system (CNS). Of all the gliomas, World Health Organization (WHO) grade IV glioma, or glioblastoma (GBM), is the most common and lethal1. GBM is highly refractory to the current standard-of-care which consists of tumor resection to the extent possible followed by radiation plus concomitant and adjuvant chemotherapy with temozolomide2. These deadly cancers carry a dismal prognosis of only 15-18 months of survival from the time of initial diagnosis with only 5% of patients surviving the disease after 5 years3. The presence of the blood brain barrier (BBB), lack of professional antigen presenting cells (APCs), and the previously unidentified existence of bona fide lymphatic structures within the brain4 have led to the notion of GBM as immune privileged. However, numerous studies now show that these brain cancers indeed engender the recruitment of peripheral immune cells that are predominantly myeloid in origin which include monocytes, macrophages, and myeloid-derived suppressor cells (MDSCs)5. GBM also influences the activity of brain-resident microglia to become pro-tumorigenic6,7. Lymphoid cells such as CD8+ T cells8 and CD56+ natural killer cells9 are also present within the tumor microenvironment, but in much fewer numbers, a fact thought to be due to immunosuppressive function instigated by glioma-derived factors on tumor associated macrophages (TAMs)10. CD4+ T cells are also present in GBM, but much of this population also expresses CD25 and FoxP3, makers of immunosuppressive T regulatory (Treg) cells11. The overall immunosuppressive state of GBM culminates in the promotion of immunologic escape and tumor progression12. A better understanding of the mechanisms of GBM immunosuppression is critical to the development of effective immunotherapeutic strategies designed to stimulate the immune system against the tumor. Over the last 15 years our lab has worked to overcome the mechanisms of brain tumor immunosuppresson in order to develop efficacious new anti-GBM immunotherapeutics13-19. The culmination of this work has now led to a clinical trial designed to evaluate a combined cytotoxic and immune-stimulatory therapeutic for patients with newly diagnosed GBM (ClinicalTrials.gov Identifier: NCT01811992). Our most recent work shows that mouse GL26 and rat CNS-1 GBM cells block anti-tumor NK cell immune surveillance by producing large amounts of the β-galactoside-binding lectin galectin-1 (gal-1)20. This was demonstrated by suppressing the expression of gal-1 in glioma cells using shRNA-mediated gene knockdown. In vitro experiments showed that gal-1-deficient glioma cells proliferated normally in culture, yet underwent rapid rejection soon after intracranial engraftment into syngeneic C57BL/6J or RAG1-/- mice, thus establishing the independence of T- or B- cells on this form of tumor rejection. NK cell immunodepletion with anti-asialo GM1 anti-serum or monoclonal NK1.1 antibodies led to the complete restoration of intracranial gal-1-deficient glioma growth, establishing the role of NK cells in gal-1-deficient glioma rejection. We now show that immunodepletion of Gr-1+/CD11b+ myeloid cells is sufficient to prevent gal-1-deficient glioma rejection despite the presence of NK cells, thus revealing a indispensible auxiliary role for myeloid cells in the aiding of NK-mediated gal-1-deficient tumor lysis (unpublished data). This unexpected result has led us to develop a comprehensive protocol for the isolation and analysis of peripheral blood mononuclear cells (PBMCs) that infiltrate the brain tumor microenvironment soon after intracranial engraftment so that we may better characterize the immune infiltration events that predicate gal-1-deficient glioma rejection. The method is demonstrated here by using mouse GL26 glioma cells that constitutively express mCitrine fluorescent protein, called GL26-Cit, which permit direct tumor cell visualization by fluorescence microscopy21. These cells are stereotactically engrafted into the brain of syngeneic C57BL/6J mice and are allowed to grow for 24, 48, or 72 hr prior to mouse euthanasia. Glioma-infiltrating PBMCs are then isolated and immunolabeled using anti -CD45, -Gr-1, -CD11b and -NK1.1 cell surface antibodies together with intracellular immunolabeling for granzyme B (GzmB). This specific combination of antibodies allows for the identification of tumor-infiltrating Gr-1+/CD11b+ myeloid cells and NK1.1+, NK cells, cell types we have been implicated in gal-1-deficient tumor rejection. The immune infiltration profile of gal-1-deficient GL26-Cit glioma, referred to here as GL26-Cit-gal1i, is then compared to that of gliomas expressing normal levels of gal-1 called GL26-Cit-NT that contain a non-targeting control shRNA hairpin. 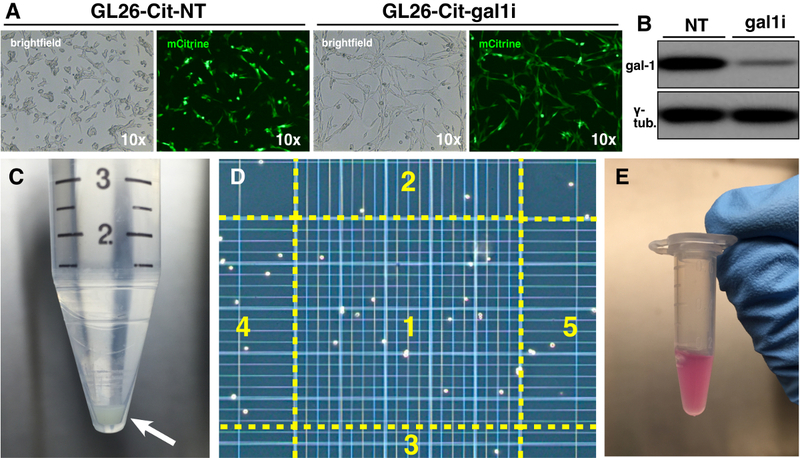 The protocol begins with a description on how to culture GL26-Cit glioma cells in vitro, which is followed by an explanation on how to orthotopically engraft these cells into the striatum of syngeneic C57BL/6J mice. It then proceeds to enumerate the steps involved in the isolation and immunolabeling of glioma-infiltrating PBMCs for flow cytometric analysis. The protocol concludes with an explanation of standard data analysis and graphical representation. The demonstration reveals that both Gr-1+/CD11b+ myeloid cells and NK1.1+ NK cells preferentially accumulate within the gal-1-deficient brain tumor microenvironment within 48 hr of tumor implantation, a result which helps explain why these tumors rapidly undergo complete tumor lysis approximately 1 week post-tumor engraftment20. The method is easily adaptable to a number of different in vivo experimental designs in which temporal data on immune infiltration into the brain is required. A single experimentalist can perform the protocol from brain harvesting to flow cytometric analysis of glioma-infiltrating PBMCs in about 4-6 hr depending on the number of samples to be analyzed. The method may also be combined with experiments aimed to characterize the profile of circulating PBMCs in tumor bearing mice for comparison with those that infiltrate the brain so to identify immunosuppression phenotypes specifically induced by the tumor microenvironment. Application of this and similar methods should facilitate a better understanding of the factors involved in the trafficking of peripheral immune cells into the brain tumor microenvironment. Note: Please review the entire protocol prior to performing experiments. Approval for the use of vertebrate animals from the appropriate institutional committee on the use and welfare of animals must be obtained prior to proceeding. Working in a class II biological safety cabinet, start by preparing GL26-Cit-NT/gal1i cell culture media by supplementing a 500 ml bottle of Dulbecco’s Modified Eagle Medium (DMEM) with 10% sterile-filtered heat-inactivated fetal bovine serum (FBS), 2 mM L-glutamine, 100 U/ml penicillin, 100 µg/ml streptomycin, 600 µg/ml G418 sulfate (for selection of the mCitrine expression vector) and 3 µg/ml of puromycin dihydrochloride (for selection of the non-targeting or gal-1-specific shRNAs). Culture GL26-Cit-NT and/or GL26-Cit-gal1i cells (Figure 1A and 1B) in a tissue culture cabinet set to 37 °C and 5% CO2 for 1-2 days prior to the tumor engraftment procedure or until the flasks reach 50-80% confluency. On the day of surgery, remove the cell culture media from the glioma cells using a 10 ml serological pipette and a pipette gun and discard the media into a waste beaker. Invert the flask top-side-down and add 10 ml of DPBS to the topside of the flask using a 10 ml serological pipette. Slowly invert the flask to cover the cells in DPBS, then tip the flask vertically and remove and discard the DPBS into a waste beaker. Add 3-4 ml of non-mammalian trypsin alternative in DPBS with EDTA (see materials list for details) to each T75 tissue culture flask and place back into the tissue culture cabinet for 2-5 min. Using a bright-field microscope, check that all of the cells have become detached from the bottom surface prior to proceeding. Inhibit further enzymatic activity by diluting the trypsin alternative with 6 ml of DPBS. Pipette up and down using a 10 ml serological pipette to rinse the bottom surface of the flask and to mechanically dissociate any cellular aggregates. Aspirate the cells and place into respectively labeled 15 ml centrifuge tubes. Spin the cells down at 550 x g (max RCF) for 5 min at 4 °C (Figure 1C). Remove the supernatant and gently resuspend the cells with 1 ml of un-supplemented DMEM. Make sure to pipette the cells up and down thoroughly with a P-1000 micropipette to achieve a single cell suspension. Make a 1:10 dilution of the resultant cell suspension generated in 1.6 by placing 18 µl of un-supplemented DMEM into a 0.6 ml conical polypropylene microtube followed by the addition of 2 µl of the tumor cell suspension. Pipette up and down using a P-10 micropipette to homogenize the cells thoroughly. Add 10 µl of the 1:10 tumor cell dilution generated in 1.7 to a separate 0.6 ml conical polypropylene microtube, then add 10 µl of Trypan blue stain to the tube. Thoroughly mix with a P-10 micropipette and add 10 µl of the resultant tumor cell/Trypan blue solution under a glass cover slip placed on top of a hemocytometer being careful not to introduce air bubbles (Figure 1D). Count the cells with a bright-field microscope using a 10X objective according to the specific protocol associated with the given hemocytometer. Be sure to factor in the 20-fold dilution of the original tumor cell suspension made during the preparation of the cells for accurate cell estimation in the original 1 ml aliquot. Use the following formula to calculate the total number of cells: total cells/ml = [((∑cells counted per square) / # of squares counted) x 20 (i.e., dilution factor) x 10,000 cells/ml]. After determining the total number of cells for each cell line used in the given experiment, spin them down at 550 x g (max RCF) for 5 min at 4 °C. Remove the supernatant(s) and resuspend the cells with an appropriate volume of un-supplemented DMEM in order to achieve a target concentration of 3 x 104 cells per 1 µl for each cell line according to the following formula: (total # of cells / 30,000). 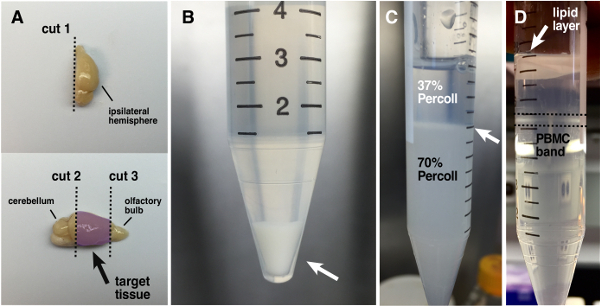 Place an equivalent volume of each cell line into respectively labeled 0.6 ml conical polypropylene tubes and place on ice (Figure 1E). Be sure to save some cells to continue propagating each cell line if separate T75s were not previously seeded. For ketamine/dexmedetomidine surgical anesthesia: remove 1.4 ml from a 10 ml vial of sterile 0.9% NaCl injection and replace with 600 µl of a 100 mg/ml stock solution of ketamine hydrochloride and 800 µl of a 0.5 mg/ml stock solution of dexmedetomidine hydrochloride to yield a mixed working solution of ketamine hydrochloride (6 mg/ml) and dexmedetomidine hydrochloride (0.04 mg/ml). For buprenorphine analgesia: remove 1 ml from a 10 ml vial of sterile 0.9% NaCl injection and replace with the entire 1 ml volume of a single 0.3 mg/ml stock buprenorphine hydrochloride ampul to yield a 0.03 mg/ml working solution. For atipamezole surgical anesthesia reversal: remove 1 ml from a 10 ml vial of sterile 0.9% NaCl injection and replace with 1 ml of a 5 mg/ml stock solution of atipamezole hydrochloride to yield a 0.5 mg/ml working solution. Working in an approved location for mouse survival surgery, begin by setting up autoclaved or bead sterilized surgical instruments and other reagents as shown in (Figure 2A), then obtain enough 8-10 week-old female C57BL/6J mice (syngeneic with GL26 glioma) required for the study; ensure their continuous access to food and water. Anesthetize the first mouse with a single intraperitoneal (i.p.) injection of the working anesthesia solution by delivering a dose of 75 mg/kg ketamine and 0.5 mg/kg dexmedetomidine (approximately 250 µl for a 20 g mouse). Next, give a 5 mg/kg subcutaneous (s.c.) injection of carprofen (approximately 100 µl for a 20 g mouse). Ensure that the mouse is non-responsive to toe and tail pinches prior to proceeding. Using surgical clippers, shave the fur from the cranium. Apply povidone-iodine antiseptic solution to the shaved area, scrub with a 70% isopropyl alcohol prep pad, then re-apply povidone-iodine antiseptic solution. Next, apply a small amount of sterile petrolatum ophthalmic ointment to each eye to prevent drying. Carefully open the mouth by reaching in with a pair of curved dissecting forceps to gently pull out the tongue and move to one side of the mouth to prevent choking. Allow the forceps to retract while in the mouth to spread the jaw open and guide the top two incisors into the keyhole of the tooth bar on the stereotactic frame. Secure the tooth bar from pivoting horizontally or vertically by adjusting the respective screws. Ensure that the mouse’s cranium is level with the bench top. Place the ear bars securely against the postorbital bones of the cranium being careful not to apply too much inward pressure on the skull in order to prevent crushing. Place the nose bar over the snout and screw down until snug. Check that there is no vertical/lateral movement in the head by applying gentle pressure with a thumb and index finger. A mouse properly placed into a stereotactic frame is shown in (Figure 2B). Using a scalpel blade, make a 1 cm midline incision over the cranium from the frontal bone to the occipital bone. Retract the skin at the incision using Colibri retractors. Lower the microliter syringe equipped with a 33 G needle attached to the vertical arm of the stereotactic frame directly above the position of bregma (Figure 2C). From there, adjust the position of the needle +0.5 mm AP, +2.5 mm ML to reach the target site for tumor implantation. Use a 1 ml tuberculin syringe equipped with a 26 G needle to mark this location by gently excoriating the periosteum. Drill a hole into the cranium at the target site until reaching the underlying dura mater using a cordless precision power drill equipped with a 1/32” (0.8 mm) bit. While drilling, apply intermittent pressure followed by removal of the drill bit from the surface of the cranium to avoid excessive heat and force that may otherwise lead to the drill bit puncturing the underlying brain tissue. Flush the microliter syringe with 0.9% NaCl in a 1.7 ml conical polypropylene microtube to ensure that the needle is not clogged. Gently flick the 0.6 ml conical polypropylene microtube containing the tumor cells several times to resuspend the cells. Draw up 2 µl of cells into the microliter syringe ensuring that no air bubbles are introduced into the syringe. Dispense 1 µl of the cells onto a 70% isopropyl alcohol prep pad leaving exactly 1 µl of tumor cells remaining in the syringe. Bring the needle down until it touches the dura mater, then introduce the needle into the brain -3.5 mm ventrally and retract by +0.5 mm. Slowly and smoothly deliver the cells by depressing the syringe plunger over the course of 1-2 min. Allow the cells to settle at the injection site for 5 min prior to slowly withdrawing the needle. Wipe any coagulated blood or brain matter from the tip of the needle with a clean 70% isopropyl alcohol prep pad. Rinse the needle and syringe thoroughly with the 0.9% NaCl from step 2.6 to ensure that the needle is not clogged for the next injection. Remove the Colibri retractors and suture the scalp using three 3-0 nylon monofilament sutures. Remove the mouse from the stereotactic frame and administer 0.1 mg/kg of buprenorphine hydrochloride subcutaneously (s.c.) (approximately 67 µl of the 0.03 mg/ml working solution for a 20 g mouse) followed by 2.5 mg/kg atipamezole hydrochloride intramuscularly (i.m.) (approximately 100 µl of the 0.5 mg/ml working solution for a 20 g mouse) for post-operative pain relief and anesthesia reversal. Place post-surgical mice back into their cages under a heating lamp to recover. Put a magnetic stirring bar into a 1 L glass screw-cap storage bottle and fill to volume with ultrapure deionized water. Place the bottle on a stirring plate. Weigh and add the following chemicals to the glass bottle while stirring: 8 g sodium chloride (NaCl), 0.264 g calcium chloride (CaCl2•2H2O), 0.05 g Sodium phosphate monobasic (NaH2PO4•2H2O), 1.0 g D-glucose (C6H12O6), 1.0 g sodium bicarbonate (NaHCO3), 0.2 g potassium chloride (KCl). Allow the salts to dissolve, then add 100 µl of a 1,000U/ml stock solution of heparin sodium to the Tyrode’s solution. Remove the container from the stirring plate and extract the stirring bar using a magnetic wand. Store heparinized Tyrode’s solution at 4 °C. For ketamine/xylazine terminal anesthesia: remove 1,360 µl from a 10 ml vial of sterile 0.9% NaCl injection and replace with 1,200 µl of a 100 mg/ml stock solution of ketamine hydrochloride and 160 µl of a 100 mg/ml stock solution of xylazine hydrochloride to yield a mixed working solution of ketamine hydrochloride (12 mg/ml) and xylazine hydrochloride (1.6 mg/ml). Prepare density centrifugation media mix solution by placing 90 ml of 10x PBS into 264 ml of ultrapure deionized water (3.93x) in a sterile plastic container. Titrate to pH 7.0-7.2 with HCl and filter sterilize through a 0.22 µm filter. Store at 4 °C. Prepare 70% density centrifugation media by combining 18 ml of density centrifugation media mix solution with 30 ml of density centrifugation media (see materials list for details) in a 50 ml polypropylene centrifuge tube. Store at 4 °C, but bring to RT before use. Prepare 37% density centrifugation media by combining 9.6 ml of DPBS with 10.4 ml 70% density centrifugation media in a 50 ml centrifuge tube. Store at 4 °C, but bring to RT before use. Fill a 4.5 L polyurethane ice bucket to capacity with ice chips. Make a combined solution of 1 mg/ml collagenase and 1 mg/ml DNase-I in sufficient quantity for 1 ml per brain sample in the study by diluting a 10 mg/ml DNase-I stock solution 1:10 and a 50 mg/ml collagenase stock solution 1:50 with sterile DPBS in a single 15 ml polypropylene centrifuge tube. Gently mix the solution by pipetting up and down with a P-1000 micropipette. Store on ice in the polyurethane bucket from step 3.7. Obtain two 7 ml glass Dounce tissue grinders. Label one “NT” and the other “gal1i”. Place the tissue grinders in the ice bucket and add 1 ml of DPBS to each. Obtain enough 15 ml centrifuge tubes to collect brain matter from each mouse in the study and place in the ice bucket. Place ~150 ml of DPBS among three 50 ml centrifuge tubes into the ice bucket. At chosen time points, anesthetize the first tumor-bearing mouse in the study using a single i.p. injection of 150 mg/kg of ketamine hydrochloride and 20 mg/kg xylazine hydrochloride (approximately 250 µl of the combined 12 mg/ml ketamine/1.6 mg/ml xylazine working solution for a 20 g mouse) to induce deep anesthesia. Ensure that the mouse is non-response to toe and tail pinches prior to proceeding. Retrieve the previously prepared Tyrode’s solution and place into a laminar flow hood dedicated to terminal animal surgical procedures. Place gas impermeable polymeric tubing attached to a carbogen tank into the Tyrode’s solution. Open the tank valve to allow 95% O2/5% CO2 carbogen to continuously bubble into the solution. Attach a 20 G aluminum hub blunt needle to the end of additional gas impermeable polymeric tubing attached to a peristaltic pump. Place the tubing at the other end of the peristaltic pump into the Tyrode’s solution and turn the pump on to allow the tubing to fill with oxygenated and heparinized Tyrode’s solution. The set up for mouse transcardial perfusion is shown in (Figure 3B). Using four 26 G needles, pin down the anesthetized mouse ventral side up by the front and hind paws on an extruded polystyrene foam block covered with a disposal absorbent towel in the laminar flow hood. Grasp the skin above the peritoneal cavity using a pair of blunt dissection forceps, and using a large pair of dissection scissors make a “Y” incision by penetrating the peritoneal wall, cutting cephalically to puncture the diaphragm, then bifurcating at the sternum to terminate at the left and right axillae. Use a hemostat to clamp the sternum and reflect the rib cage over the mouse’s left shoulder. Remove the pericardium with the pair of blunt dissection forceps. Turn on the peristaltic pump to begin a steady drip of oxygenated and heparinized Tyrode’s solution (roughly 2.3-2.5 ml/min). Insert the blunt needle into the left ventricle of the heart. Use a small pair of dissection scissors to snip the right atrium to allow for exsanguination (Figure 3C). Allow the Tyrode’s solution to thoroughly perfuse the mouse circulatory system until the liver and lungs have completely blanched due to the lack of blood. Ensure that no gross amounts of blood continue to exit the right atrium prior to removing the 20 G aluminum hub blunt needle from the left ventricle. Unpin the mouse from the extruded polystyrene foam block and turn the mouse ventral side down. Using a large pair of dissection scissors, separate the head from the rest of the body at the level of the neck. Using a small pair of dissection scissors, cut the scalp at the midline beginning at the occipital bone working forward towards the snout in order to expose the cranium. Retract the skin on both sides of the cranium using a thumb and index finger and hold the skull securely. Use a pair of bone Rongeurs to break through the cranium beginning at the occipital bone and work forward to completely expose the dorsal and lateral surfaces of the brain. Be careful to minimize damage to the brain. Once the cranial bones have been removed, turn the head of the mouse ventral side up and use a small pair of dissection scissors to cut the cranial nerves at the base of the brain in order to liberate it from the skull. Using a clean single edged razor blade, isolate the area of the brain containing the tumor by making a sagittal cut down the center of the brain to bisect the two hemispheres. Turn the ipsilateral hemisphere medial side down and make two coronal cuts at the levels of the cerebellum and the olfactory bulb to isolate the target tissue containing the tumor implant (Figure 4A). An equivalent portion of the contralateral hemisphere may also be isolated and used as a negative control. Place the target tissue into the respectively labeled glass Dounce tissue grinder containing 1 ml of DPBS, push the plunger all the way down and twist 7 times to initially disrupt the tissue. Lift the plunger to allow the liquid to settle back to the bottom of the tissue grinder. Repeat this step thrice; however only twist the plunger 4 times during the next two repeats and 3 times during the last repeat to avoid over triturating the tissue. Using a P-1000 micropipette, sequentially apply three 1 ml volumes of ice-cold DPBS (prepared in 3.11) along the sides of the plunger to rinse into the tissue grinder. Resuspend the triturated brain matter by pipetting up and down and place into a labeled 15 ml centrifuge tube on ice. Rinse the sides of the Dounce tissue grinder with 1 additional ml of ice-cold DPBS and add to the same 15 ml centrifuge tube. Keep all tubes containing triturated brain matter on ice until all samples have been processed. Repeat steps 3.13-3.25 and 4.1-4.4 for each mouse in the study. Once all samples have been processed, spin down the triturated brain matter in the 15 ml centrifuge tubes at 740 x g (max RCF) for 20 min at 4 °C. Remove the supernatant with a 10 ml serological pipette and pipette gun and resuspend the pelleted brain matter in 1 ml of the previously prepared collagenase/DNase-I digestive enzymes using a P-1000. Place the 15 ml centrifuge tubes into a test tube rack and place in a 37 °C water bath for 15 min. Gently agitate the samples twice throughout the incubation period by flicking the tubes to facilitate tissue disaggregation. Add 6 ml of ice-cold DPBS using a 10 ml serological pipette to each tube to dilute the digestive enzymes. Pipette up and down to resuspend, and filter the total volumes through sterile 70 µm nylon mesh filters into new labeled 15 ml centrifuge tubes on ice. Spin the brain cell suspension down at 740 x g (max RCF) for 20 min at 4 °C to achieve a single cell pellet (Figure 4B). After removing the 15 ml tubes from the centrifuge place them on ice and increase the temperature setting on the centrifuge to about 21 °C in preparation for the next step. Fully remove the supernatant from each tube containing brain cells and initially resuspend the pellets in 1 ml of 70% density centrifugation media using a P-1000 micropipette. Then add 4 additional milliliters of 70% density centrifugation media to each tube using a 10 ml serological pipette. Screw the caps on securely and homogenize the cell suspension by gently inverting to tubes several times. Remove the 15 ml centrifuge tubes containing brain cells resuspended in 70% density centrifugation media from ice, and place in a test tube rack at RT. One at a time, carefully overlay 2 ml of 37% density centrifugation media solution onto the 5 ml of 70% density centrifugation media with a P-1000 micropipette to form a clean interface between the two density centrifugation media layers (Figure 4C). Use a fine-tipped marker to indicate the position of the interface so it can be easily identified after centrifugation, when the distinction becomes less apparent. Spin down the 15 ml centrifuge tubes at 740 x g (max RCF) for 20 min at RT with no break to avoid disrupting the interface. After centrifugation, collect the PBMCs that have accumulated at the interface between the two density centrifugation media layers (Figure 4D) by introducing a P-200 micropipette into the tube along its side, carefully bypassing the lipid layer. Once at the level of the PBMC band, slowly extract 200 µl from the surface of the 70% density centrifugation media layer and place into a respectively labeled polypropylene FACS tube on ice. Repeat once for a total volume of 400 µl per sample. Add 3 ml of flow buffer to each FACS tube containing 400 µl of PBMCs to sufficiently dilute the density centrifugation media, then spin the cells down at 660 x g (max RCF) for 20 min at 4 °C. Engraft one C57BL/6J mouse with GL26-Cit-gal1i and another with GL26-Cit-NT according to the procedure outlined in section 2. After 72 hr of tumor growth, euthanize both mice and isolate the tumor-infiltrating PBMCs according to the procedures outlined throughout sections 3 and 4. Combine the two PBMC samples (NT and gal1i) into one volume (i.e., 100 µl), then further divide the sample evenly among three FACS tubes (i.e., 33.3 µl per tube) labeled “CD45 isotype”, “Gr-1/CD11b isotype”, and “NK1.1 isotype”. Add the following antibodies (each at a 1:100 dilution and diluted to a total volume of 200 µl in flow buffer) to the respectively labeled FACS tubes: “CD45 isotype”: Alexa Fluor 700-conjugated rat IgG2b, κ (clone: RTK4530); “Gr-1/CD11b isotype”: Alexa Fluor 700-conjugated rat anti-mouse CD45 (clone: 30-F11), PE-conjugated rat IgG2b, κ (clone: eB149/10H5), and PerCP/Cy5.5-conjugated rat IgG2b, κ (clone: RTK4530); “NK1.1 isotype”: Alexa Fluor 700-conjugated rat anti-mouse CD45 (clone: 30-F11), PE-conjugated rat anti-mouse Gr-1 (clone:RB6-8C5), PerCP/Cy5.5-conjugated rat anti-mouse CD11b (clone: M1/70), and APC-conjugated mouse IgG2a, κ (clone: eBM2a). Allow PBMCs to immunolabel on ice in the dark for 20 min. Flick the tubes once halfway through the incubation period to gently mix. Wash with 1 ml of flow buffer, spin down at 660 x g (max RCF) for 10 min at 4 °C and resuspend each FACS tube containing PBMCs with 200 µl of flow buffer. Using a flow cytometer equipped with an 85 µm integrated nozzle, analyze the “CD45 isotype“ tube first to establish a baseline CD45 interval gate. Next, run the “Gr-1/CD11b isotype” tube to establish a baseline Gr-1/CD11b quadrant gate using only true CD45+ cells as input. Finally, run the “NK1.1 isotype” tube to establish a baseline NK1.1 interval gate using only true CD45+/Gr-1low/CD11b+/- cells as input. Make a sufficient quantity of a 1:100 dilution of cell surface antibodies in flow buffer to achieve a 200 µl volume per sample (plus 1 for the GzmB isotype): Alexa Fluor 700-conjugated rat anti-mouse CD45 (clone: 30-F11), PE-conjugated rat anti-mouse Gr-1 (clone:RB6-8C5), PerCP/Cy5.5-conjugated rat anti-mouse CD11b (clone: M1/70), APC-conjugated mouse anti-mouse NK1.1 (clone: PK136). Carefully remove the supernatant of the spun down PBMCs from 4.15 until the meniscus is just above the bottom of each FACS tube (~50 µl) to avoid cell losses. Resuspend the PBMCs in each FACS tube using the residual flow buffer with a P-200 micropipette and remove (1/# of samples) worth of the volume from each FACS tube and combine into a new FACS tube labeled “pooled isotype”. Add 200 µl of the cell surface antibody cocktail prepared in 5.2.1 to each PBMC sample. Allow PBMCs to immunolabel on ice in the dark for 20 min. Flick the tubes once halfway through the incubation period to gently mix. Wash with 1 ml of flow buffer; spin down at 660 x g (max RCF) x 10 min at 4 °C. Resuspend all FACS tubes containing PBMCs in 200 µl of a commercially available formalin-based fixative (see materials list for details) for 15 min on ice in the dark. Flick the tubes once halfway through the incubation period to gently mix. Wash with 1 ml of a commercially available 1x permeabilization/wash buffer (see materials list for details) and spin down at 660 x g (max RCF) for 10 min at 4 °C. While PBMCs are spinning down, prepare a sufficient quantity of a 1:100 dilution of Pacific Blue-conjugated mouse anti-mouse GzmB (Clone: GB11) intracellular antibodies in 1x permeabilization/wash buffer to achieve a 200 µl volume per sample. In a separate tube, prepare a single 200 µl volume of a 1:100 dilution of Pacific Blue-conjugated mouse IgG1, κ (clone: MOPC-21) isotype control antibody. Resuspend each of the experimental PBMC samples with 200 µl of the 1:100 dilution of anti-mouse GzmB antibodies and resuspend the single FACS tube labeled “pooled isotype” with the 200 µl volume of the 1:100 dilution of isotype antibodies. Allow all PBMC samples to immunolabel on ice in the dark for 20 min. Flick the tubes once halfway through the incubation period to gently mix. Wash with 1 ml of flow buffer; spin down at 660 x g (max RCF) for 10 min at 4 °C and resuspend PBMCs with 200 µl of flow buffer for analysis. Flow cytometrically analyze glioma-infiltrating PBMCs using an 85 µm integrated nozzle and the gates and PMT voltages previously established in section 5.122. Be sure to run the entire volume of each sample on the flow cytometer to ensure a fair comparison of the total number of glioma-infiltrating PBMCs in each sample. The following gating strategy is used for a typical experiment: FSC-A vs. SSC-A → SSC-H vs. SSC-W → FSC-H vs. FSC-W → CD45 vs. count → Gr-1 vs. CD11b → NK1.1 vs. count. Gates placed on Gr-1+/CD11b+ myeloid cells and NK1.1+ NK cells are then stratified based on GzmB expression (Figure 5A). 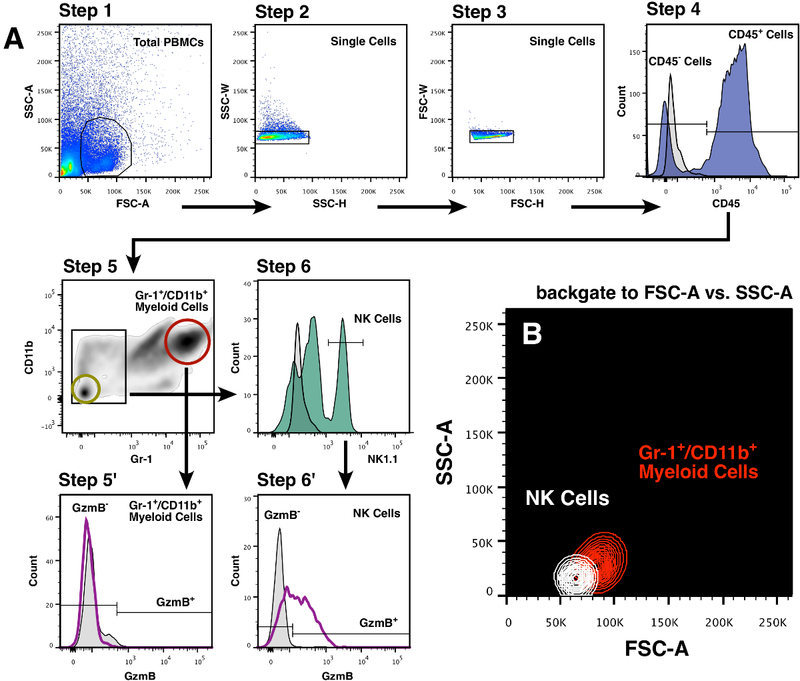 Backgating those cells identified as NK1.1+ NK cells and Gr-1+/CD11b+ myeloid cells in our experiments onto FSC-A vs. SSC-A confirms the smaller lymphoid size of NK cells and the relatively large size of myeloid cells (Figure 5B). Raw data files (i.e., fcs files) are analyzed by commercially available flow cytometric data analysis software such as Flowjo. A total of 18 C57BL/6J mice were used to demonstrate this method. Nine (9) were engrafted with GL26-Cit-NT and 9 were engrafted with GL26-Cit-gal1i on the same day using equivalent number of cells (3x104). Three mice from each group were euthanized at 24, 48, and 72 hr post-tumor engraftment. The data show that engraftment of GL26-Cit-gal1i glioma cells into the brain of syngeneic C57BL/6J mice rapidly induces the recruitment of CD45+ PBMCs (Figure 6A). Based on the specific antibody cocktail used in the demonstration it can further be shown that Gr-1+/CD11b+ myeloid cells and NK1.1+ NK cells specifically enter the gal-1-deficient tumor microenvironment within 48 hr of tumor engraftment (Figure 6B and 6C); however the total number of glioma-infiltrating myeloid cells far outweighs that of NK cells. Figure 1: Preparation of GL26-Cit Cells for Intracranial Engraftment. (A) Representative 10X bright-field and epifluorescence micrographs of GL26-Cit-NT (left images) and GL26-Cit-gal1i (right images) cells grown in culture. (B) Western blot of GL26-Cit-NT (left lane) and GL26-Cit-gal1i (right lane) whole cell lysate. Gamma tubulin (γ-tub.) is shown as a loading control. (C) GL26-Cit cell pellet from an approximately 50% confluent T75 tissue culture flask after centrifugation at 550 x g (max RCF) for 5 min at 4 °C. (D) Bright-field view of a hemocytometer containing GL26-Cit cells (white dots) diluted 1:1 with Trypan Blue to assess cell number and viability. Cells should be >90% viable to ensure reproducible tumor growth. The average of the cell counts from the squares labeled 1 through 5 should be taken to increase the accuracy of cell count estimation. 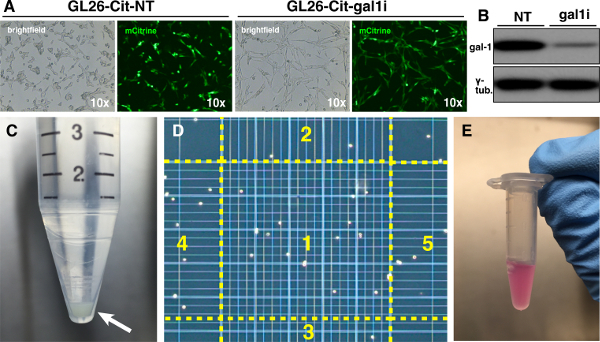 (E) GL26-Cit cells resuspended at 3 x 104 cells/μl in un-supplemented DMEM for intracranial implantation. Please click here to view a larger version of this figure. Figure 2: Stereotactic Engraftment of Glioma Cells into the Striatum of C57BL/6J Mice. (A) Surgical suite layout showing the required surgical instruments and reagents. (B) Close up view of a C57BL/6J mouse harnessed in a stereotactic frame with proper needle placement at +0.5 mm AP, +2.5 mm ML, and -3.0 mm DV relative to bregma. (C) Dorsal view of the mouse skull showing the position of bregma and the target site for tumor cell engraftment. Please click here to view a larger version of this figure. Figure 3: Mouse Transcardial Perfusion. (A) Required reagents for dissection, trituration, and enzymatic digestion of mouse brain tissue. 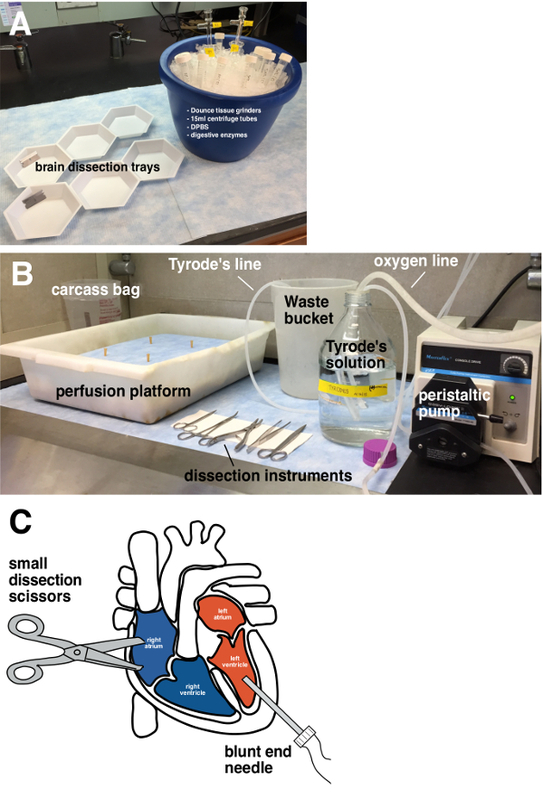 (B) Layout of the instruments and reagents required for mouse transcardial perfusion with oxygenated and heparinized Tyrodes’s solution shown in a laminar flow hood dedicated to terminal mouse surgical procedures. (C) Schematic representation of the heart demonstrating proper instruments and placements required for transcardial perfusion. Please click here to view a larger version of this figure. Figure 4: Isolation of Glioma-infiltrating PBMCs. (A) Strategy for the dissection of mouse brain tissue containing early stage orthotopic glioma implants. The top panel demonstrates the sagittal bisection of the ipsilateral hemisphere away from the contralateral hemisphere. The bottom panel demonstrates the two additional coronal cuts necessary to isolate the target tissue containing the tumor implant (highlighted in purple). (B) Single cell brain tissue pellet (white arrow) after enzymatic digestion, filtration through a 70 μm nylon mesh and centrifugation. (C) Properly poured density centrifugation media gradient prior to centrifugation. The white arrow indicates the clean interface formed between the two density centrifugation media layers. (D) Density centrifugation media gradient after centrifugation demonstrating the lipid layer that forms at the top of the 37% density centrifugation media layer white arrow) and the PBMC band (outlined by the dashed black lines) at the interface between the two layers. Please click here to view a larger version of this figure. Figure 5: Flow Cytometric Gating Strategy Used to Identify Glioma-infiltrating Gr-1+/CD11b+ Myeloid Cells and NK Cells. (A) Step 1: Total immunolabeled cells isolated from the PBMC band of a density centrifugation media gradient are gated on to exclude cellular debris (FSC-A less than ~50 K). Steps 2 and 3: Doublet discrimination gating to filter out cellular aggregates. Step 4: CD45 gate to identify glioma-infiltrating immune cells. Isotype control is shown as the grey silhouette. Step 5: CD45+ cells stratified based on Gr-1 and CD11b. Isotype control for both Gr-1 and CD11b is overlaid on the plot and enclosed by the gold circle. The red circle indicates Gr-1+/CD11b+ myeloid cells. Step 5’: Gr-1+/CD11b+ myeloid cells stratified based on GzmB expression. As predicated, these cells do not label with anti-GzmB antibodies over isotype control (grey silhouette). Step 6: Gr-1low cells outlined by the black rectangle in Step 5 stratified based on NK1.1 expression. Isotype control is shown as the grey silhouette. Step 6’: NK1.1high cells stratified based on GzmB expression. These cells indeed label with anti-GzmB antibodies above isotype control (grey silhouette). (B) Backgating of Gr-1+/CD11b+ myeloid cells onto FSC-A vs. SSC-A demonstrating that NK cells have a smaller lymphoid size as compared to the larger sized Gr-1+/CD11b+ myeloid cells. Please click here to view a larger version of this figure. Figure 6: Comparison of PBMC Infiltration into the GL26-Cit-NT vs. GL26-Cit-gal1i Tumor Microenvironment over the First Three Days of Intracranial Tumor Growth. (A) Total CD45+ immune cells. (B) CD45+/Gr-1+/CD11b+ myeloid cells. (C) CD45+/NK1.1+ NK cells. Data points from PBMCs isolated from GL26-Cit-gal1i gliomas are connected by smooth lines, whiles those isolated from GL26-Cit-NT gliomas are connected by dashed lines. Glioma-infiltrating PBMCs from three mice were analyzed per tumor type at each time point. Numbers associated with each data point on the GL26-Cit-gal1i curves represent the fold-induction of that particular PBMC type over GL26-Cit-NT at the specified hour post-tumor implantation (HPI). Data represent the mean number of immune cells counted ± the standard error of the mean (SEM). Statistical analysis was performed by 2-way analysis of variance. Please click here to view a larger version of this figure. This protocol describes a robust and reproducible method for the isolation and flow cytometric analysis of PBMCs that have infiltrated the early mouse brain tumor microenvironment. Glioma cell suspensions are generated at a concentration specified by the experimentalist that are stereotactically engrafted into the striatum of the mouse brain. Mice are then euthanized at predetermined time points specified by the experimental design and their brains are harvested and processed to isolate glioma-infiltrating PBMCs which are immunolabeled with combinations of fluorochrome-conjugated primary antibodies; immunolabeled cells are then quantified by flow cytometry. Although the demonstration presented here focuses on early time points, glioma-infiltrating PBMCs can be assessed at any time point post-tumor engraftment up until mouse moribundity. The method is highly modular as any number of different antibody combinations may be used to examine immune cells of interest including T cells, B cells, NK cells, monocytes, and macrophages. Note that the protocol has been optimized for use with female C57BL/6J mice 8-10 weeks of age. Mice outside of this age range may have altered percentages of circulating PBMCs, which may lead to cell counts at equivalent time points that are not representative of the data presented here. Characterization experiments may also be required if alternative tumor models are used or if mice other than those on the B6 background are used due to the fact that strains can differ in their PBMC profiles (Jaxpheno6; Mouse Phenome Database; the Jackson Laboratory). Gender and environmental conditions can also be sources of disparity among PBMC frequencies and percentages. This method has been demonstrated using a combination of four cell surface antibodies that enable the detection of Gr-1+/CD11b+ myeloid cells and NK1.1+ NK cells, cell types implicated in the rejection of gal-1-deficient glioma. The inclusion of intracellular GzmB antibodies further enables the detection of cytotoxic potential in the NK cell subset. Representative results are provided for immune cell infiltration into early GL26-Cit gliomas in syngeneic C57BL/6J mice that either express normal levels of gal-1 or which have reduced levels due to shRNA-mediated gene knockdown. The demonstration exhibits the sensitivity and reproducibility of the technique by showing that glioma-infiltrating PBMCs can be reproducibly isolated and quantified as soon as 24 hr post-tumor engraftment. Aside from revealing a population of tumor-infiltrating Gr-1high/CD11b+ myeloid cells, the demonstration also reveals a population of Gr-1int./CD11b+ cells whose identity is currently undefined; additional experiments are necessary to further decipher the character of this cell population. We also note that we do not observe a readily distinguishable population of CD45int/Gr-1-/CD11bhigh/NK1.1- cells consistent with microglia as previously described by others23,24. A simple explanation for this result is that the specific isolation protocol used here precludes their accumulation at the 37/70 density centrifugation media interface. It is also important to point out that the cells collected from the 37/70 density centrifugation interface do not appear to include the glioma cells themselves. This is evident by the fact that GL26-Cit glioma cells, which appear between 100-200K on SSC-A and 100K of FSC-A using equivalent PMT voltages to those used in this demonstration (data not shown) are absent from the FSC-A vs. SSC-A plots (refer to Figure 5A; Step 1). Anti-Gr-1 antibodies recognize both the Ly6G and Ly6C cell surface proteins that are specific to polymorphonuclear and mononuclear myeloid cells, respectively25. The use of anti-Gr-1 antibodies thus precludes distinction between these two cell populations. Preliminary results in our lab are now beginning to shed light on a more accurate description of the early Gr-1+/CD11b+ cells that infiltrate the gal-1-deficient glioma microenvironment. Experiments incorporating anti-Ly6G (clone: 1A8) and anti-Ly6C (clone: AL-21) antibodies together with anti-CCR2 antibodies now indicate that the Gr-1high/CD11b+ cells infiltrating the early gal-1-deficient tumor microenvironment are consistent with Ly6Chigh/CCR2high inflammatory monocytes, although further experiments are required to confirm this result (data not shown). Due to cell loses that may occur during the repeat centrifugation and resuspension steps involved in isolating glioma-infiltrating PBMCs, it is likely that observed cell counts are in fact lower that what are actually present in the intact brain. However, differences between experimental groups should hold if equivalent volumes of the 37/70 density centrifugation media interface are extracted and if the entire volume of each sample is analyzed by the flow cytometer. Failure to adhere to these steps will result in unfair comparisons between samples and will preclude unbiased analysis. The inability to quantify the exact number of PBMCs entering the brain tumor microenvironment is not a limitation specific to this protocol. Alternative methods such as immunohistological cell counting strategies are also subject to error due to extrapolations of total cell numbers based on stereological counts and the requirement of equivalent image thresholding on tissue section micrographs, which may differ in their level of background staining, potentially leading to false-negative or false-positive signals. Nevertheless, a comparison of time course analysis between different analytical methods should reveal time-dependent immune-influx curves with similar overall shape. An additional drawback to immunohistochemical methods is the inability of certain antibodies validated for flow cytometry to bind to the equivalent antigenic epitope in the context of formalin-fixed brain tissue sections. There are a few key steps in this protocol that may serve as limitations for those unfamiliar with its methodology. One such step is the harvesting of the brain from the cranium without damaging it. We suggest practicing the technique several times prior to running proper experiments. However, since the brain will eventually be triturated, minor damage to the superficial layers of the brain are likely inconsequential to the accurate quantification of glioma-infiltrating PBMCs. A second step that inexperienced investigators may initially find difficult is the pouring of the density centrifugation media gradient. The experimentalists’ ability to form a clean interface while overlying the 2 ml of 37% density centrifugation media on top of the 70% layer is crucial to reproducible isolation of PBMCs. Although this step may initially prove challenging, it vastly enriches for PBMCs and dramatically decreases the period of time otherwise required for sample analysis if whole brain tissue where to be analyzed flow cytometrically. PBMC enrichment also reduces the total number of events captured by the flow cytometer, thus reducing .fcs file sizes and helping to resolve rare brain-infiltrating immune cell populations. For best results in establishing a clean density centrifugation interface we recommend pouring the 37% density centrifugation media using a P-1000 micropipette with smooth plunger action. Angle the 15 ml centrifuge tube approximately 20-30° above the bench top. Rest the tip of the micropipette on the side of the tube 3-5 ml markings above the surface of the 70% density centrifugation media layer. Pour steadily and slowly so to minimize overt outward momentum of the 37% density centrifugation media as it extrudes from the micropipette tip in order to avoid disturbing the underlying 70% density centrifugation media. Lastly, the fact that the brain tissue architecture is necessarily destroyed in the process of isolating glioma-infiltrating PBMCs means that additional mice will be required to obtain time point matched histological data. Newer glioma models generated through the injection of oncogenic plasmid DNA into the normal rodent brain have been developed in recent years26-32. These “endogenous” tumor models circumvent potential artifacts caused by stereotactically engrafting ex vivo cancer cells and more closely mimic the histological hallmarks of clinical glioma. The method described herein is well suited to the study of immune infiltration events that characterize these more clinically relevant model systems. Studies on immune influx in neonatal mice may also be performed using this method although the density of neonatal mouse brain is less than that of adults, which may require an optimization of the enzymatic digestion step in order to prevent over digestion of the brain tissue. Additional applications of the technique include investigations on alternative classes of inflammatory brain disease aside from malignant tumors such as experimental allergic encephalomyelitis (EAE) and immune responses to viral infection. This work was supported by National Institutes of Health/National Institute of Neurological Disorders & Stroke (NIH/NINDS) grants R01-NS074387, R01-NS057711 and R21-NS091555 to M.G.C. ; NIH/NINDS grants R01-NS061107, R01-NS076991, R01-NS082311 and R21-NS084275 to P.R.L. ; grants from Leah’s Happy Hearts, University of Michigan Comprehensive Cancer Center awarded to M.G.C. and P.R.L; the Department of Neurosurgery, University of Michigan School of Medicine; the Michigan Institute for Clinical and Health Research, supported by NIH grant 2UL1-TR000433; the University of Michigan Cancer Biology Training Grant supported by NIH/NCI (National Cancer Institute) grant T32-CA009676; the University of Michigan Training in Clinical and Basic Neuroscience supported by NIH/NINDS grant T32-NS007222; and the University of Michigan Medical Scientist Training Program supported by NIH/NIGMS (National Institute of General Medicine Sciences) grant T32-GM007863. The authors are thankful for the academic leadership and support received from Dr. Karin Muraszko and the Department of Neurosurgery; to M. Dahlgren, D. Tomford, and S. Napolitan for superb administrative support; to M. Dzaman for outstanding technical assistance; and to Phil F. Jenkins for generous support toward the purchase of a Zeiss 3D Scanning Electron Microscope. We also acknowledge the Kuchroo laboratory at Harvard Medical School from which a modified version of the density centrifugation media-mediated strategy for isolation of brain mononuclear cells was drawn. Bleeker, F. E., Molenaar, R. J., Leenstra, S. Recent advances in the molecular understanding of glioblastoma. J Neurooncol. 108, 11-27 (2012). Stupp, R., et al. Radiotherapy plus concomitant and adjuvant temozolomide for glioblastoma. N Engl J Med. 352, 987-996 (2005). Ostrom, Q. T., et al. CBTRUS statistical report: primary brain and central nervous system tumors diagnosed in the United States in 2007-2011. Neuro Oncol. 16, Suppl 4. iv1-63 (2014). Louveau, A., et al. Structural and functional features of central nervous system lymphatic vessels. Nature. 523, 337-341 (2015). Kennedy, B. C., et al. Tumor-associated macrophages in glioma: friend or foe? J Oncol.. 2013, 486912 (2013). Markovic, D. S., Glass, R., Synowitz, M., Rooijen, N., Kettenmann, H. Microglia stimulate the invasiveness of glioma cells by increasing the activity of metalloprotease-2. J Neuropathol Exp Neurol. 64, 754-762 (2005). Zhai, H., Heppner, F. L., Tsirka, S. E. Microglia/macrophages promote glioma progression. Glia. 59, 472-485 (2011). Kmiecik, J., et al. Elevated CD3+ and CD8+ tumor-infiltrating immune cells correlate with prolonged survival in glioblastoma patients despite integrated immunosuppressive mechanisms in the tumor microenvironment and at the systemic level. J Neuroimmunol. 264, 71-83 (2013). Yang, I., Han, S. J., Sughrue, M. E., Tihan, T., Parsa, A. T. Immune cell infiltrate differences in pilocytic astrocytoma and glioblastoma: evidence of distinct immunological microenvironments that reflect tumor biology. J Neurosurg. 115, 505-511 (2011). Wagner, S., et al. Microglial/macrophage expression of interleukin 10 in human glioblastomas. Int J Cancer. 82, 12-16 (1999). El Andaloussi, A., Lesniak, M. S. An increase in CD4+CD25+FOXP3+ regulatory T cells in tumor-infiltrating lymphocytes of human glioblastoma multiforme. Neuro Oncol. 8, 234-243 (2006). Kostianovsky, A. M., Maier, L. M., Anderson, R. C., Bruce, J. N., Anderson, D. E. Astrocytic regulation of human monocytic/microglial activation. J Immunol. 181, 5425-5432 (2008). Curtin, J. F., et al. HMGB1 mediates endogenous TLR2 activation and brain tumor regression. PLoS Med. 6, e10 (2009). Curtin, J. F., et al. Fms-like tyrosine kinase 3 ligand recruits plasmacytoid dendritic cells to the brain. J Immunol. 176, 3566-3577 (2006). Mineharu, Y., et al. Engineering the brain tumor microenvironment enhances the efficacy of dendritic cell vaccination: implications for clinical trial design. Clin Cancer Res. 17, 4705-4718 (2011). Larocque, D., et al. Exogenous fms-like tyrosine kinase 3 ligand overrides brain immune privilege and facilitates recognition of a neo-antigen without causing autoimmune neuropathology. Proc Natl Acad Sci U S A. 107, 14443-14448 (2010). Curtin, J. F., et al. Treg depletion inhibits efficacy of cancer immunotherapy: implications for clinical trials. PLoS One. 3, e1983 (2008). Ali, S., et al. Combined immunostimulation and conditional cytotoxic gene therapy provide long-term survival in a large glioma model. Cancer Res. 65, 7194-7204 (2005). Dewey, R. A., et al. Chronic brain inflammation and persistent herpes simplex virus 1 thymidine kinase expression in survivors of syngeneic glioma treated by adenovirus-mediated gene therapy: implications for clinical trials. Nat Med. 5, 1256-1263 (1999). Baker, G. J., et al. Natural killer cells eradicate galectin-1-deficient glioma in the absence of adaptive immunity. Cancer Res. 74, 5079-5090 (2014). Baker, G. J., et al. Mechanisms of glioma formation: iterative perivascular glioma growth and invasion leads to tumor progression, VEGF-independent vascularization, and resistance to antiangiogenic therapy. Neoplasia. 16, 543-561 (2014). Ormerod, M. G., Novo, D. Flow cytometry : a basic introduction. (2008). Stirling, D. P., Yong, V. W. Dynamics of the inflammatory response after murine spinal cord injury revealed by flow cytometry. J Neurosci Res. 86, 1944-1958 (2008). Hirai, T., et al. The prevalence and phenotype of activated microglia/macrophages within the spinal cord of the hyperostotic mouse (twy/twy) changes in response to chronic progressive spinal cord compression: implications for human cervical compressive myelopathy. PLoS One. 8, e64528 (2013). Fleming, T. J., Fleming, M. L., Malek, T. R. Selective expression of Ly-6G on myeloid lineage cells in mouse bone marrow. RB6-8C5 mAb to granulocyte-differentiation antigen (Gr-1) detects members of the Ly-6 family. J Immunol. 151, 2399-2408 (1993). Wiesner, S. M., et al. De novo induction of genetically engineered brain tumors in mice using plasmid DNA. Cancer Res. 69, 431-439 (2009). Holland, E. C., et al. Combined activation of Ras and Akt in neural progenitors induces glioblastoma formation in mice. Nat Genet. 25, 55-57 (2000). Lynes, J., et al. Lentiviral-induced high-grade gliomas in rats: the effects of PDGFB, HRAS-G12V, AKT, and IDH1-R132H. Neurotherapeutics. 11, 623-635 (2014). de Vries, N. A., et al. Rapid and robust transgenic high-grade glioma mouse models for therapy intervention studies. Clin Cancer Res. 16, 3431-3441 (2010). Uhrbom, L., et al. Ink4a-Arf loss cooperates with KRas activation in astrocytes and neural progenitors to generate glioblastomas of various morphologies depending on activated Akt. Cancer Res. 62, 5551-5558 (2002). Marumoto, T., et al. Development of a novel mouse glioma model using lentiviral vectors. Nat Med. 15, 110-116 (2009). Assanah, M., et al. Glial progenitors in adult white matter are driven to form malignant gliomas by platelet-derived growth factor-expressing retroviruses. J Neurosci. 26, 6781-6790 (2006).